My recent adventures in jewelry creation involved items from Toronto's premiere ribbon store, Midori. I got leather and fabric cords, pom poms and tassels. The kazuri beads come from Kenya and have the most wonderful iridescent glazes. 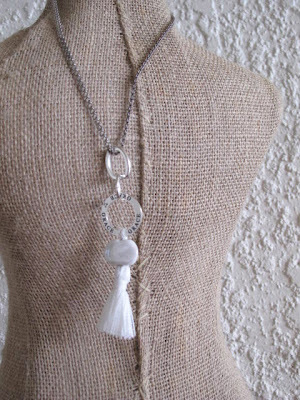 The resulting necklaces are whimsical and weightless, but still meaningful. I love the idea of wearing words that mean something, and as for the Kazuri story, click on the link to see how disadvantaged Kenyan women are creating hope and opportunity with each unique and beautiful bead.